Even though it was the desire to share the Contessa camera that Finnish Maria Larsson (Maria Heiskanen) had won in a community raffle that led to her nuptials with Sigge (Mikael Persbrandt) who would father her seven children in Sweden, the camera remained unused in their marriage until she stumbled on it years later in need of money for food. Bringing it to the local photography shop run by the Danish immigrant, Mr. Sebastian Pedersen (Jesper Christensen) in the hopes of either pawning or selling it for quick cash when her dockworker husband joins his coworkers in a strike, Maria is taken aback when the man presents her with an unusual proposition after finding an undeveloped photo in the plate. Either struck by her plight, politeness, desperation or perhaps the way the light mingled with shadow in the composition of that fateful plate, Sebastian offers to purchase the camera from Maria as long as she cares for it in the mean time and continues to take pictures with supplies that he provides her, without the knowledge of any other employees throughout the course of the near decade spanning film. And it's with this unique arrangement that Maria is once again reminded why she was so drawn to the Contessa so many years before she realized just what her married life would become with a man whom, despite his best intention in accompanying her to Temperance Society meetings in the early 1900s, can never seem to make it for more than short periods of time without giving back into the disease of alcoholism. For sadly despite all of his promises to the contrary, the drink turns the hardworking father into an abusive, violent, tyrannical and downright unpredictable beast that Maria cannot bring herself to leave no matter how bad it gets. And although her children take up most of her time as she not only works with them in tandem with their teachers in ensuring their reading level stays strong but also takes control of their well-being in traditional matriarchal roles that tragically include getting in the way of her husband's belt to protect them, soon Maria begins to find solace in looking at life from behind the lens. Poor but passionate and subservient but smart, the camera offers Maria a way to assert her independence by taking control of something in her life for the first time since she said “I do,” as she seems to have a knack for composition and finding the beauty in places that she may never thought to look beforehand. Yet sure enough, once Sigge gets wind of her new-found hobby that eventually brings in additional money into the house as neighbors and friends ask her for keepsake pictures and family portraits, Maria's husband views the camera as an irrational threat, identifying the inanimate object as if it were another man with whom Maria had become romantically involved. Needless to say Sigge is a hypocrite several times over for regularly cheating on his wife with a lascivious barmaid. However, his feeling of being threatened on a masculine level aren't entirely without warrant as Maria's skill as a photographer indicates that with the proper set-up she could be quite capable of providing for herself along with the fact that, even though neither character has ever acted on their feelings, Sebastian's encouragement and belief in Maria has made their professional friendship blossom into something that twinges with romantic possibility. Cruelly dominating her once again by forcibly impregnating his wife to keep her in line before his actions slide to even more dangerous territory before the film ends, The Emigrants filmmaker Jan Troell's Everlasting Moments is rough going from our modern point-of-view as it's hard to understand just why Maria refuses to leave her wicked husband. Nonetheless and as fiercely independent and stubborn as our shutterbug lead, the filmmaker who also shares a cinematography credit on the work, remains unwilling to judge any of his characters. Moreover, it's been marvelously crafted either with a special filter, lens, or post-production wizardry to give the overall look of the film a rusted bronze tint as if to remind us that Everlasting Moments is in itself capable of being broken down into thousands of still images that may as well have been clicked into existence by Maria Larsson. A movie of many contradictions as it moves from extraordinary sensitivity to harsh brutality, the overall effect of the work cinematically recalls the feel of Once Upon a Time in America and Days of Heaven. 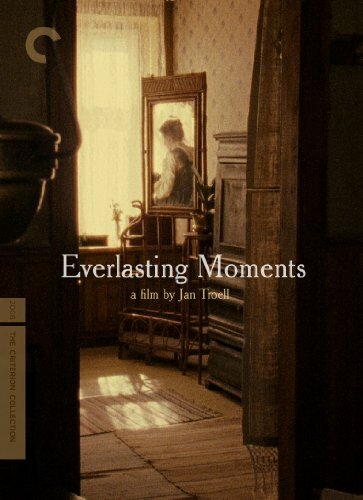 Based on a novel written by Troell's wife Agneta and inspired by the life of one of her relatives, Troell's gorgeous film which was Sweden's official submission for the Best Foreign Language Film category of last year's Academy Awards makes a fitting addition to the Criterion Collection. Since the work does clock in at an overly long 131 minutes, testing our patience and tolerance a bit as it continues and we sit on pins and needles with worry over the explosive Sigge, Criterion has presented the work across two DVDs where one showcases the feature presentation and the second delves into special features. 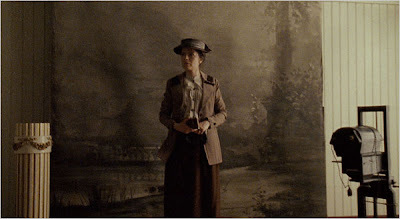 A fascinating and extremely rare look at gender dynamics in Sweden during the early twentieth century, although some may find the roughness of the movie's edges to be a little more than they can bear, if you stick with it, the rewards are well worth it as you watch this particular picture and especially the photographer in question develop over time.